GET 50% OFF ON ALL DESIGNS WHEN YOU BUY NOW! Choose a FREE SAMPLER (8 bonus designs) every time you spend $20! This ITH project is done in 4 hoopings. It measures 2cm top when folded x 9cm high x 19.5cm wide when closed. 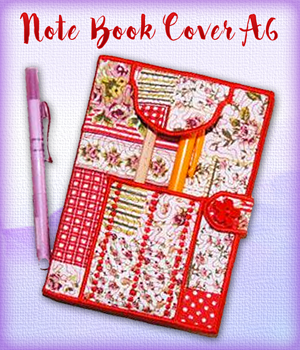 There are 2 zipper pockets, 2 Slots for paper mone and 8 Slots for cards which can hold several cards in each slot. 8x8 hoop. This great notebook cover is both beautiful and useful. 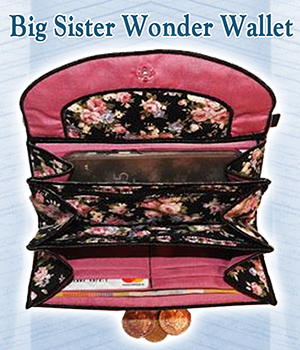 It is perfect for you to carry in your purse or your teen to put in their backpack. Keep one handy near the telephone or in kitchen. A pouch holds receipts and notes. Full instructions included. 5x7 hoop.